I think it has been about a year since either Alex or I made a blog post. It’s been a pretty chaotic year, with some terrible lows but some wonderful occasions to celebrate as well. On a personal level I stopped baking and cooking for over 9 months. Slowly I’ve started again and decided to ease back into blogging with a simple recipe. I think Blueberry Muffins are one of those wonderful treats that I never knew could be so spectacularly disappointing. I made these muffins about 6 weeks ago after making them countless times to find them flat and unappealing. Knowing it had more to do with me, than the recipe, I decided to search for a new recipe, as a personal quest and turned to a book I’ve owned for years and rarely used “The Art & Soul of Baking.” I adapted the Raspberry Muffins recipe and was delighted with result. These are a sweet muffin, and I substituted blueberries for raspberries (having 300g of frozen blueberries in my freezer). 1. Preheat oven to 200c. Grease/line your muffin tray. I used paper liners on a 12 muffin tray. 2. In a large bowl sift together the flour, sugar, baking powder, baking soda and salt. 3. Melt the butter with the lemon zest (the book notes this will ensure the lemon zest is distributed evenly). Add the butter milk and leave the mixture to sit for 1-2 minutes. 4. Whisk the butter mixture, eggs and vanilla together until blended. 5. Add a well to the centre of the dry ingredients and add the liquid mixture taking care to blend. (Mix until just combined). 6. Add the blueberries and stir until the blueberries are equally distributed in the batter. 7. I use an ice-cream scoop to spoon the mixture into the pans. 9. Turn onto a wire rack. Don’t feel too bad – I’ve just started blogging again after three years! Lovely looking muffins by the way. Can I add in a pinch of coffee to this recipe? 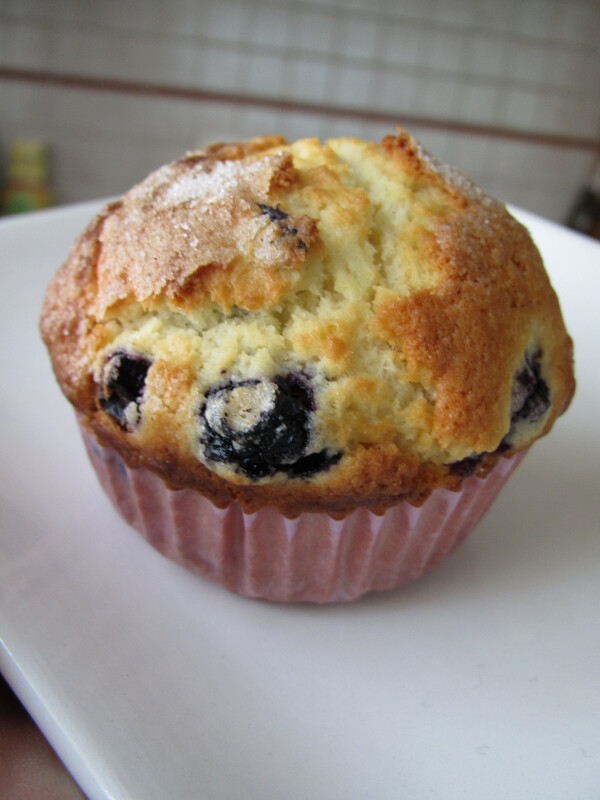 I can’t see why not – muffins are quite versatile and are open to your favourite flavour. I would mix with the melted butter to ensure the coffee flavour is evenly distributed. I would probably leave out the lemon zest depending on how much coffee you use.